Tradeloop's Member Blog And News: A Free iPad Is Going To A Tradeloop User. Could It Be You? A Free iPad Is Going To A Tradeloop User. Could It Be You? 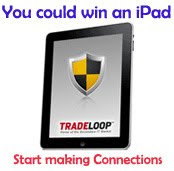 There's still time to win a free iPad from Tradeloop! Just make 10 approved Connections and get started creating your own Trusted Network of dealers within the Tradeloop community. That's all you have to do - no forms to fill out, no emails required, and no purchase necessary. When we draw for the iPad, anyone with 10 approved Connections is automatically entered to win. From the Dealer Directory, search for individuals or companies you'd like to add to your Trusted Network. That link takes you to the "Request Connection" page where you can type a short personal invitation. The Manage Connections link on your Tradeloop Account Home page displays the status of your network: who's Connected, who's invited you to join their networks, and invitations you've sent.